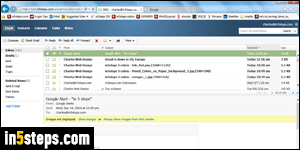 By default, Rackspace Mail displays 50 messages per "page" in any of your folders. Depending on your display size and screen resolution, this may be too much, or too little. Showing less emails per screen loads faster, but requires more pagination clicks to go from one page in the current folder to the next. 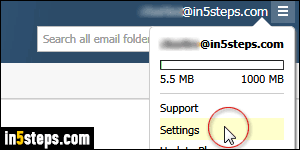 Fortunately, you can customize both the number of emails shown at any given point, and the position of the reading pane, which does help as you'll see. 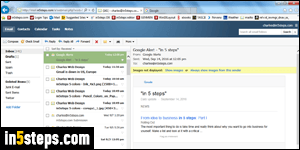 The previous screenshot shows the reading pane on the right, with the email folder listing on the left. Notice how each message is two-line high. 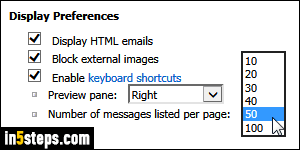 To change the number of messages displayed, click on the "hamburger" menu icon in the top right corner of the page, and pick Settings from the dropdown menu. Make sure that General Settings are selected on the left. On the right, click on the Number of messages listed per page dropdown, and pick a number between 10 and 100. There is no "right number" - this depends on how you like to process incoming mail. Personally, I like 30 per page: just enough to show all my latest messages, but without requiring too much scrolling! Now onto the reading pane, which Rackspace Mail calls "preview pane". You can show it on the right, as I have it in the first screenshot. 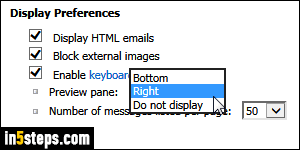 Or you can hide it altogether: in that case, you have to double-click on any email you want to read (quickly tiresome!) If you choose to show it at the bottom, emails will only take "one line" worth of height. Once you're done, click on the Save button. For demonstration purposes, I've changed by preview pane to the bottom: contrast this screenshot with the first one in this tutorial. Notice that you get more width for the current message, but less scrolling height for the folder listing, now visible at the top. But this is counterbalanced by the fact that each message is only "one line high", compared with the previous setup!